Aaron Colwell (until April 2015), Google Inc.
Can I use Media Source Extensions? If you wish to make comments or file bugs regarding this document in a manner that is tracked by the editors, please submit them via our public bug database. The working group maintains a list of all bug reports that the editors have not yet tried to address; there may also be open bugs in the previous bug tracker. This draft highlights some of the pending issues that are still to be discussed in the working group. No decision has been taken on the outcome of these issues including whether they are valid. Implementors should be aware that this specification is not stable. Implementors who are not taking part in the discussions are likely to find the specification changing out from under them in incompatible ways. Vendors interested in implementing this specification before it eventually reaches the Candidate Recommendation stage should join the mailing list mentioned below and take part in the discussions. The following features are at risk and may be removed due to lack of implementation. For this specification to exit the Candidate Recommendation stage, two independent implementations as detailed in the CR Exit Criteria (Public Permissive version 3) document will be required to pass each test in the MSE test suite to be developed by the HTML Media Extensions WG. This document was published by the HTML Media Extensions Working Group as an Editor's Draft. If you wish to make comments regarding this document, please send them to public-html-media@w3.org (subscribe, archives). All comments are welcome. Publication as an Editor's Draft does not imply endorsement by the W3C Membership. This is a draft document and may be updated, replaced or obsoleted by other documents at any time. It is inappropriate to cite this document as other than work in progress. Define a splicing and buffering model that facilitates use cases like adaptive streaming, ad-insertion, time-shifting, and video editing. Leverage the browser cache as much as possible. Provide requirements for byte stream format specifications. Not require support for any particular media format or codec. Normative behavior for user agents to enable interoperability between user agents and web applications when processing media data. Normative requirements to enable other specifications to define media formats to be used within this specification. The track buffers that provide coded frames for the enabled audioTracks, the selected videoTracks, and the "showing" or "hidden" textTracks. All these tracks are associated with SourceBuffer objects in the activeSourceBuffers list. A presentation timestamp range used to filter out coded frames while appending. The append window represents a single continuous time range with a single start time and end time. Coded frames with presentation timestamp within this range are allowed to be appended to the SourceBuffer while coded frames outside this range are filtered out. The append window start and end times are controlled by the appendWindowStart and appendWindowEnd attributes respectively. A unit of media data that has a presentation timestamp, a decode timestamp, and a coded frame duration. The duration of a coded frame. For video and text, the duration indicates how long the video frame or text should be displayed. For audio, the duration represents the sum of all the samples contained within the coded frame. For example, if an audio frame contained 441 samples @44100Hz the frame duration would be 10 milliseconds. The sum of a coded frame presentation timestamp and its coded frame duration. It represents the presentation timestamp that immediately follows the coded frame. A group of coded frames that are adjacent and have monotonically increasing decode timestamps without any gaps. Discontinuities detected by the coded frame processing algorithm and abort() calls trigger the start of a new coded frame group. The decode timestamp indicates the latest time at which the frame needs to be decoded assuming instantaneous decoding and rendering of this and any dependant frames (this is equal to the presentation timestamp of the earliest frame, in presentation order, that is dependant on this frame). If frames can be decoded out of presentation order, then the decode timestamp must be present in or derivable from the byte stream. The user agent must run the append error algorithm with the decode error parameter set to true if this is not the case. If frames cannot be decoded out of presentation order and a decode timestamp is not present in the byte stream, then the decode timestamp is equal to the presentation timestamp. The delay between a frame's presentation time and the actual time it was displayed, in a double-precision value in seconds & rounded to the nearest display refresh interval. This delay is always greater than or equal to zero since frames must never be displayed before their presentation time. Non-zero delays are a sign of playback jitter and possible loss of A/V sync. A sequence of bytes that contain all of the initialization information required to decode a sequence of media segments. This includes codec initialization data, Track ID mappings for multiplexed segments, and timestamp offsets (e.g. edit lists). The byte stream format specifications in the byte stream format registry [ MSE-REGISTRY ] contain format specific examples. A sequence of bytes that contain packetized & timestamped media data for a portion of the media timeline. Media segments are always associated with the most recently appended initialization segment. A MediaSource object URL is a unique Blob URI [ FILE-API ] created by createObjectURL(). It is used to attach a MediaSource object to an HTMLMediaElement. These URLs are the same as a Blob URI, except that anything in the definition of that feature that refers to File and Blob objects is hereby extended to also apply to MediaSource objects. The origin of the MediaSource object URL is the effective script origin of the document that called createObjectURL(). For example, the origin of the MediaSource object URL affects the way that the media element is consumed by canvas. The parent media source of a SourceBuffer object is the MediaSource object that created it. The presentation start time is the earliest time point in the presentation and specifies the initial playback position and earliest possible position. All presentations created using this specification have a presentation start time of 0. The presentation interval of a coded frame is the time interval from its presentation timestamp to the presentation timestamp plus the coded frame's duration. For example, if a coded frame has a presentation timestamp of 10 seconds and a coded frame duration of 100 milliseconds, then the presentation interval would be [10-10.1). Note that the start of the range is inclusive, but the end of the range is exclusive. The order that coded frames are rendered in the presentation. The presentation order is achieved by ordering coded frames in monotonically increasing order by their presentation timestamps. A reference to a specific time in the presentation. The presentation timestamp in a coded frame indicates when the frame must be rendered. A position in a media segment where decoding and continuous playback can begin without relying on any previous data in the segment. For video this tends to be the location of I-frames. In the case of audio, most audio frames can be treated as a random access point. Since video tracks tend to have a more sparse distribution of random access points, the location of these points are usually considered the random access points for multiplexed streams. The specific byte stream format specification that describes the format of the byte stream accepted by a SourceBuffer instance. The byte stream format specification, for a SourceBuffer object, is selected based on the type passed to the addSourceBuffer() call that created the object. A specific set of tracks distributed across one or more SourceBuffer objects owned by a single MediaSource instance. A single SourceBuffer with 1 audio track and/or 1 video track. Two SourceBuffers with one handling a single audio track and the other handling a single video track. MediaSource objects must support each of the configurations above, but they are only required to support one configuration at a time. Supporting multiple configurations at once or additional configurations is a quality of implementation issue. A byte stream format specific structure that provides the Track ID, codec configuration, and other metadata for a single track. Each track description inside a single initialization segment has a unique Track ID. The user agent must run the append error algorithm with the decode error parameter set to true if the Track ID is not unique within the initialization segment. A Track ID is a byte stream format specific identifier that marks sections of the byte stream as being part of a specific track. The Track ID in a track description identifies which sections of a media segment belong to that track. The MediaSource object represents a source of media data for an HTMLMediaElement. It keeps track of the readyState for this source as well as a list of SourceBuffer objects that can be used to add media data to the presentation. MediaSource objects are created by the web application and then attached to an HTMLMediaElement. The application uses the SourceBuffer objects in sourceBuffers to add media data to this source. The HTMLMediaElement fetches this media data from the MediaSource object when it is needed during playback. closed Indicates the source is not currently attached to a media element. open The source has been opened by a media element and is ready for data to be appended to the SourceBuffer objects in sourceBuffers. ended The source is still attached to a media element, but endOfStream() has been called. Terminates playback and signals that a network error has occured. Terminates playback and signals that a decoding error has occured. Contains the subset of sourceBuffers that are providing the selected video track, the enabled audio track(s), and the "showing" or "hidden" text track(s). The Changes to selected/enabled track state section describes how this attribute gets updated. Allows the web application to set the presentation duration. The duration is initially set to NaN when the MediaSource object is created. If the readyState attribute is "closed" then return NaN and abort these steps. Return the current value of the attribute. If the value being set is negative or NaN then throw a TypeError exception and abort these steps. If the readyState attribute is not "open" then throw an InvalidStateError exception and abort these steps. If the updating attribute equals true on any SourceBuffer in sourceBuffers, then throw an InvalidStateError exception and abort these steps. Run the duration change algorithm with new duration set to the value being assigned to this attribute. appendBuffer(), appendStream() and endOfStream() can update the duration under certain circumstances. The event handler for the sourceclose event. The event handler for the sourceended event. The event handler for the sourceopen event. Indicates the current state of the MediaSource object. When the MediaSource is created readyState must be set to "closed". Contains the list of SourceBuffer objects associated with this MediaSource. When readyState equals "closed" this list will be empty. Once readyState transitions to "open" SourceBuffer objects can be added to this list by using addSourceBuffer(). Adds a new SourceBuffer to sourceBuffers. If type is an empty string then throw a TypeError exception and abort these steps. If type contains a MIME type that is not supported or contains a MIME type that is not supported with the types specified for the other SourceBuffer objects in sourceBuffers, then throw a NotSupportedError exception and abort these steps. If the user agent can't handle any more SourceBuffer objects or if creating a SourceBuffer based on type would result in an unsupported SourceBuffer configuration, then throw a QuotaExceededError exception and abort these steps. For example, a user agent may throw a QuotaExceededError exception if the media element has reached the HAVE_METADATA readyState. This can occur if the user agent's media engine does not support adding more tracks during playback. If the readyState attribute is not in the "open" state then throw an InvalidStateError exception and abort these steps. Create a new SourceBuffer object and associated resources. Set the generate timestamps flag on the new object to the value in the "Generate Timestamps Flag" column of the byte stream format registry [ MSE-REGISTRY ] entry that is associated with type. Set the mode attribute on the new object to "sequence". Set the mode attribute on the new object to "segments". Add the new object to sourceBuffers and queue a task to fire a simple event named addsourcebuffer at sourceBuffers. Signals the end of the stream. Run the end of stream algorithm with the error parameter set to error. Check to see whether the MediaSource is capable of creating SourceBuffer objects for the specified MIME type. If true is returned from this method, it only indicates that the MediaSource implementation is capable of creating SourceBuffer objects for the specified MIME type. An addSourceBuffer() call may still fail if sufficient resources are not available to support the addition of a new SourceBuffer. This method returning true implies that HTMLMediaElement.canPlayType() will return "maybe" or "probably" since it does not make sense for a MediaSource to support a type the HTMLMediaElement knows it cannot play. If type is an empty string, then return false. If type does not contain a valid MIME type string, then return false. If type contains a media type or media subtype that the MediaSource does not support, then return false. If type contains a codec that the MediaSource does not support, then return false. If the MediaSource does not support the specified combination of media type, media subtype, and codecs then return false. Removes a SourceBuffer from sourceBuffers. If sourceBuffer specifies an object that is not in sourceBuffers then throw a NotFoundError exception and abort these steps. Abort the buffer append and stream append loop algorithms if they are running. Set the sourceBuffer.updating attribute to false. Queue a task to fire a simple event named abort at sourceBuffer. Queue a task to fire a simple event named updateend at sourceBuffer. Let SourceBuffer audioTracks list equal the AudioTrackList object returned by sourceBuffer.audioTracks. Let HTMLMediaElement audioTracks list equal the AudioTrackList object returned by the audioTracks attribute on the HTMLMediaElement. Let the removed enabled audio track flag equal false. Set the sourceBuffer attribute on the AudioTrack object to null. If the enabled attribute on the AudioTrack object is true, then set the removed enabled audio track flag to true. Remove the AudioTrack object from the HTMLMediaElement audioTracks list. Queue a task to fire a trusted event named removetrack, that does not bubble and is not cancelable, and that uses the TrackEvent interface, at the HTMLMediaElement audioTracks list. Remove the AudioTrack object from the SourceBuffer audioTracks list. Queue a task to fire a trusted event named removetrack, that does not bubble and is not cancelable, and that uses the TrackEvent interface, at the SourceBuffer audioTracks list. If the removed enabled audio track flag equals true, then queue a task to fire a simple event named change at the HTMLMediaElement audioTracks list. Let SourceBuffer videoTracks list equal the VideoTrackList object returned by sourceBuffer.videoTracks. Let HTMLMediaElement videoTracks list equal the VideoTrackList object returned by the videoTracks attribute on the HTMLMediaElement. Let the removed selected video track flag equal false. Set the sourceBuffer attribute on the VideoTrack object to null. If the selected attribute on the VideoTrack object is true, then set the removed selected video track flag to true. Remove the VideoTrack object from the HTMLMediaElement videoTracks list. Queue a task to fire a trusted event named removetrack, that does not bubble and is not cancelable, and that uses the TrackEvent interface, at the HTMLMediaElement videoTracks list. Remove the VideoTrack object from the SourceBuffer videoTracks list. Queue a task to fire a trusted event named removetrack, that does not bubble and is not cancelable, and that uses the TrackEvent interface, at the SourceBuffer videoTracks list. If the removed selected video track flag equals true, then queue a task to fire a simple event named change at the HTMLMediaElement videoTracks list. Let SourceBuffer textTracks list equal the TextTrackList object returned by sourceBuffer.textTracks. Let HTMLMediaElement textTracks list equal the TextTrackList object returned by the textTracks attribute on the HTMLMediaElement. Let the removed enabled text track flag equal false. Set the sourceBuffer attribute on the TextTrack object to null. If the mode attribute on the TextTrack object is set to "showing" or "hidden", then set the removed enabled text track flag to true. Remove the TextTrack object from the HTMLMediaElement textTracks list. Queue a task to fire a trusted event named removetrack, that does not bubble and is not cancelable, and that uses the TrackEvent interface, at the HTMLMediaElement textTracks list. Remove the TextTrack object from the SourceBuffer textTracks list. Queue a task to fire a trusted event named removetrack, that does not bubble and is not cancelable, and that uses the TrackEvent interface, at the SourceBuffer textTracks list. If the removed enabled text track flag equals true, then queue a task to fire a simple event named change at the HTMLMediaElement textTracks list. If sourceBuffer is in activeSourceBuffers, then remove sourceBuffer from activeSourceBuffers and queue a task to fire a simple event named removesourcebuffer at the SourceBufferList returned by activeSourceBuffers. Remove sourceBuffer from sourceBuffers and queue a task to fire a simple event named removesourcebuffer at the SourceBufferList returned by sourceBuffers. Destroy all resources for sourceBuffer. sourceopen Event readyState transitions from "closed" to "open" or from "ended" to "open". sourceended Event readyState transitions from "open" to "ended". sourceclose Event readyState transitions from "open" to "closed" or "ended" to "closed". A MediaSource object can be attached to a media element by assigning a MediaSource object URL to the media element src attribute or the src attribute of a <source> inside a media element. A MediaSource object URL is created by passing a MediaSource object to createObjectURL(). If the resource fetch algorithm absolute URL matches the MediaSource object URL, ignore any preload attribute of the media element, skip any optional steps for when preload equals none, and run the following steps right before the "Perform a potentially CORS-enabled fetch" step in the resource fetch algorithm. If readyState is NOT set to "closed"
Run the "If the media data cannot be fetched at all, due to network errors, causing the user agent to give up trying to fetch the resource" steps of the resource fetch algorithm. Set the readyState attribute to "open". Queue a task to fire a simple event named sourceopen at the MediaSource. Continue the resource fetch algorithm by running the "Perform a potentially CORS-enabled fetch" step. Text in the resource fetch algorithm that refers to "the download" or "bytes received" refer to data passed in via appendBuffer() and appendStream(). References to HTTP in the resource fetch algorithm do not apply because the HTMLMediaElement does not fetch media data via HTTP when a MediaSource is attached. The following steps are run in any case where the media element is going to transition to NETWORK_EMPTY and queue a task to fire a simple event named emptied at the media element. These steps must be run right before the transition. Set the readyState attribute to "closed". Remove all the SourceBuffer objects from activeSourceBuffers. Queue a task to fire a simple event named removesourcebuffer at activeSourceBuffers. Remove all the SourceBuffer objects from sourceBuffers. Queue a task to fire a simple event named removesourcebuffer at sourceBuffers. Queue a task to fire a simple event named sourceclose at the MediaSource. Going forward, this algorithm is intended to be externally called and run in any case where the attached MediaSource, if any, must be detached from the media element. It may be called on HTMLMediaElement [ HTML51 ] operations like load() and fetch() in addition to, or in place of, when the media element transitions to NETWORK_EMPTY. The media element looks for media segments containing the new playback position in each SourceBuffer object in activeSourceBuffers. If the HTMLMediaElement.readyState attribute is greater than HAVE_METADATA, then set the HTMLMediaElement.readyState attribute to HAVE_METADATA. The media element waits until an appendBuffer() or an appendStream() call causes the coded frame processing algorithm to set the HTMLMediaElement.readyState attribute to a value greater than HAVE_METADATA. The web application can use buffered to determine what the media element needs to resume playback. The media element resets all decoders and initializes each one with data from the appropriate initialization segment. The media element feeds coded frames from the active track buffers into the decoders starting with the closest random access point before the new playback position. Resume the seek algorithm at the "Await a stable state" step. The following steps are periodically run during playback to make sure that all of the SourceBuffer objects in activeSourceBuffers have enough data to ensure uninterrupted playback. Changes to activeSourceBuffers also cause these steps to run because they affect the conditions that trigger state transitions. Having enough data to ensure uninterrupted playback is an implementation specific condition where the user agent determines that it currently has enough data to play the presentation without stalling for a meaningful period of time. This condition is constantly evaluated to determine when to transition the media element into and out of the HAVE_ENOUGH_DATA ready state. These transitions indicate when the user agent believes it has enough data buffered or it needs more data respectively. An implementation may choose to use bytes buffered, time buffered, the append rate, or any other metric it sees fit to determine when it has enough data. The metrics used may change during playback so web applications should only rely on the value of HTMLMediaElement.readyState to determine whether more data is needed or not. When the media element needs more data, the user agent should transition it from HAVE_ENOUGH_DATA to HAVE_FUTURE_DATA early enough for a web application to be able to respond without causing an interruption in playback. For example, transitioning when the current playback position is 500ms before the end of the buffered data gives the application roughly 500ms to append more data before playback stalls. Set the HTMLMediaElement.readyState attribute to HAVE_METADATA. Set the HTMLMediaElement.readyState attribute to HAVE_ENOUGH_DATA. Queue a task to fire a simple event named canplaythrough at the media element. Playback may resume at this point if it was previously suspended by a transition to HAVE_CURRENT_DATA. Set the HTMLMediaElement.readyState attribute to HAVE_FUTURE_DATA. If the previous value of HTMLMediaElement.readyState was less than HAVE_FUTURE_DATA, then queue a task to fire a simple event named canplay at the media element. Set the HTMLMediaElement.readyState attribute to HAVE_CURRENT_DATA. If this is the first transition to HAVE_CURRENT_DATA, then queue a task to fire a simple event named loadeddata at the media element. Playback is suspended at this point since the media element doesn't have enough data to advance the media timeline. During playback activeSourceBuffers needs to be updated if the selected video track, the enabled audio track(s), or a text track mode changes. When one or more of these changes occur the following steps need to be followed. Remove the SourceBuffer from activeSourceBuffers. Add the SourceBuffer to activeSourceBuffers. Follow these steps when duration needs to change to a new duration. If the current value of duration is equal to new duration, then return. If new duration is less than the highest starting presentation timestamp of any buffered coded frames for all SourceBuffer objects in sourceBuffers, then throw an InvalidStateError exception and abort these steps. Duration reductions that would truncate currently buffered media are disallowed. When truncation is necessary, use remove() to reduce the buffered range before updating duration. Set old duration to the current value of duration. Update duration to new duration. This condition can occur because the coded frame removal algorithm preserves audio frames and text cues that start before and end after the duration. Update new duration to the highest end time reported by the buffered attribute across all SourceBuffer objects in sourceBuffers. Update the media controller duration to new duration and run the HTMLMediaElement duration change algorithm. This algorithm gets called when the application signals the end of stream via an endOfStream() call or an algorithm needs to signal a decode error. This algorithm takes an error parameter that indicates whether an error will be signalled. Change the readyState attribute value to "ended". Queue a task to fire a simple event named sourceended at the MediaSource. Run the duration change algorithm with new duration set to the highest end time reported by the buffered attribute across all SourceBuffer objects in sourceBuffers. This allows the duration to properly reflect the end of the appended media segments. For example, if the duration was explicitly set to 10 seconds and only media segments for 0 to 5 seconds were appended before endOfStream() was called, then the duration will get updated to 5 seconds. Notify the media element that it now has all of the media data. If error is set to "network"
Run the "If the connection is interrupted after some media data has been received, causing the user agent to give up trying to fetch the resource" steps of the resource fetch algorithm. If error is set to "decode"
Run the "If the media data can be fetched but is found by inspection to be in an unsupported format, or can otherwise not be rendered at all" steps of the resource fetch algorithm. Run the media data is corrupted steps of the resource fetch algorithm. The timestamps in the media segment determine where the coded frames are placed in the presentation. Media segments can be appended in any order. Media segments will be treated as adjacent in time independent of the timestamps in the media segment. Coded frames in a new media segment will be placed immediately after the coded frames in the previous media segment. The timestampOffset attribute will be updated if a new offset is needed to make the new media segments adjacent to the previous media segment. Setting the timestampOffset attribute in "sequence" mode allows a media segment to be placed at a specific position in the timeline without any knowledge of the timestamps in the media segment. The presentation timestamp for the end of the append window. This attribute is initially set to positive Infinity. On getting, Return the initial value or the last value that was successfully set. If this object has been removed from the sourceBuffers attribute of the parent media source, then throw an InvalidStateError exception and abort these steps. If the updating attribute equals true, then throw an InvalidStateError exception and abort these steps. If the new value equals NaN, then throw a TypeError and abort these steps. If the new value is less than or equal to appendWindowStart then throw a TypeError exception and abort these steps. Update the attribute to the new value. The presentation timestamp for the start of the append window. This attribute is initially set to the presentation start time. If the new value is less than 0 or greater than or equal to appendWindowEnd then throw a TypeError exception and abort these steps. The list of AudioTrack objects created by this object. Indicates what TimeRanges are buffered in the SourceBuffer. This attribute is initially set to an empty TimeRanges object when the object is created. If this object has been removed from the sourceBuffers attribute of the parent media source then throw an InvalidStateError exception and abort these steps. Let highest end time be the largest track buffer ranges end time across all the track buffers managed by this SourceBuffer object. Let intersection ranges equal a TimeRange object containing a single range from 0 to highest end time. Let track ranges equal the track buffer ranges for the current track buffer. If readyState is "ended", then set the end time on the last range in track ranges to highest end time. Let new intersection ranges equal the intersection between the intersection ranges and the track ranges. Replace the ranges in intersection ranges with the new intersection ranges. If intersection ranges does not contain the exact same range information as the current value of this attribute, then update the current value of this attribute to intersection ranges. Return the current value of this attribute. Controls how a sequence of media segments are handled. This attribute is initially set by addSourceBuffer() after the object is created. Let new mode equal the new value being assigned to this attribute. If generate timestamps flag equals true and new mode equals "segments", then throw a TypeError exception and abort these steps. Set the readyState attribute of the parent media source to "open"
Queue a task to fire a simple event named sourceopen at the parent media source. If the append state equals PARSING_MEDIA_SEGMENT, then throw an InvalidStateError and abort these steps. If the new mode equals "sequence", then set the group start timestamp to the group end timestamp. Update the attribute to new mode. The event handler for the abort event. The event handler for the error event. The event handler for the update event. The event handler for the updateend event. The event handler for the updatestart event. The list of TextTrack objects created by this object. Controls the offset applied to timestamps inside subsequent media segments that are appended to this SourceBuffer. The timestampOffset is initially set to 0 which indicates that no offset is being applied. Let new timestamp offset equal the new value being assigned to this attribute. If the mode attribute equals "sequence", then set the group start timestamp to new timestamp offset. Update the attribute to new timestamp offset. Specifies the default values to use if kind, label, and/or language information is not available in the initialization segment when the initialization segment received algorithm needs to create track objects. This attribute is initially set to an empty TrackDefaultList object. Indicates whether the asynchronous continuation of an appendBuffer(), appendStream(), or remove() operation is still being processed. This attribute is initially set to false when the object is created. The list of VideoTrack objects created by this object. Aborts the current segment and resets the segment parser. If the readyState attribute of the parent media source is not in the "open" state then throw an InvalidStateError exception and abort these steps. If the range removal algorithm is running, then throw an InvalidStateError exception and abort these steps. Set the updating attribute to false. Queue a task to fire a simple event named abort at this SourceBuffer object. Queue a task to fire a simple event named updateend at this SourceBuffer object. Run the reset parser state algorithm. Set appendWindowStart to the presentation start time. Set appendWindowEnd to positive Infinity. Appends the segment data in an ArrayBuffer[ TYPED-ARRAYS ] to the source buffer. The steps for this method are the same as the ArrayBufferView version of appendBuffer(). Appends the segment data in an ArrayBufferView[ TYPED-ARRAYS ] to the source buffer. Run the prepare append algorithm. Add data to the end of the input buffer. Set the updating attribute to true. Queue a task to fire a simple event named updatestart at this SourceBuffer object. Asynchronously run the buffer append algorithm. Appends segment data to the source buffer from a ReadableStream[ WHATWG-STREAMS-API ]. Asynchronously run the stream append loop algorithm with stream and maxSize. Removes media for a specific time range. If duration equals NaN, then throw a TypeError exception and abort these steps. If start is negative or greater than duration, then throw a TypeError exception and abort these steps. If end is less than or equal to start or end equals NaN, then throw a TypeError exception and abort these steps. Run the range removal algorithm with start and end as the start and end of the removal range. A track buffer stores the track descriptions and coded frames for an individual track. The track buffer is updated as initialization segments and media segments are appended to the SourceBuffer. Each track buffer has a last decode timestamp variable that stores the decode timestamp of the last coded frame appended in the current coded frame group. The variable is initially unset to indicate that no coded frames have been appended yet. Each track buffer has a last frame duration variable that stores the coded frame duration of the last coded frame appended in the current coded frame group. The variable is initially unset to indicate that no coded frames have been appended yet. Each track buffer has a highest end timestamp variable that stores the highest coded frame end timestamp across all coded frames in the current coded frame group that were appended to this track buffer. The variable is initially unset to indicate that no coded frames have been appended yet. Each track buffer has a need random access point flag variable that keeps track of whether the track buffer is waiting for a random access point coded frame. The variable is initially set to true to indicate that random access point coded frame is needed before anything can be added to the track buffer. Each track buffer has a track buffer ranges variable that represents the presentation time ranges occupied by the coded frames currently stored in the track buffer. For specification purposes, this information is treated as if it were stored in a normalized TimeRanges object. For track buffer ranges, these "presentation time ranges" are based on Presentation Time Stamps (PTS), frame durations, and potentially coded frame group start times for coded frame groups across track buffers in a muxed SourceBuffer. updatestart Event updating transitions from false to true. update Event The append or remove has successfully completed. updating transitions from true to false. updateend Event The append or remove has ended. error Event An error occurred during the append. updating transitions from true to false. abort Event The append or remove was aborted by an abort() call. updating transitions from true to false. All SourceBuffer objects have an internal append state variable that keeps track of the high-level segment parsing state. It is initially set to WAITING_FOR_SEGMENT and can transition to the following states as data is appended. WAITING_FOR_SEGMENT Waiting for the start of an initialization segment or media segment to be appended. PARSING_INIT_SEGMENT Currently parsing an initialization segment. PARSING_MEDIA_SEGMENT Currently parsing a media segment. The input buffer is a byte buffer that is used to hold unparsed bytes across appendBuffer() and appendStream() calls. The buffer is empty when the SourceBuffer object is created. The buffer full flag keeps track of whether appendBuffer() or appendStream() is allowed to accept more bytes. It is set to false when the SourceBuffer object is created and gets updated as data is appended and removed. The group start timestamp variable keeps track of the starting timestamp for a new coded frame group in the "sequence" mode. It is unset when the SourceBuffer object is created and gets updated when the mode attribute equals "sequence" and the timestampOffset attribute is set, or the coded frame processing algorithm runs. The group end timestamp variable stores the highest coded frame end timestamp across all coded frames in the current coded frame group. It is set to 0 when the SourceBuffer object is created and gets updated by the coded frame processing algorithm. The group end timestamp stores the highest coded frame end timestamp across all track buffers in a SourceBuffer. Therefore, care should be taken in setting the mode attribute when appending multiplexed segments in which the timestamps are not aligned across tracks. The generate timestamps flag is a boolean variable that keeps track of whether timestamps need to be generated for the coded frames passed to the coded frame processing algorithm. This flag is set by addSourceBuffer() when the SourceBuffer object is created. Loop Top: If the input buffer is empty, then jump to the need more data step below. If the input buffer contains bytes that violate the SourceBuffer byte stream format specification, then run the append error algorithm with the decode error parameter set to true and abort this algorithm. Remove any bytes that the byte stream format specifications say must be ignored from the start of the input buffer. If the beginning of the input buffer indicates the start of an initialization segment, set the append state to PARSING_INIT_SEGMENT. If the beginning of the input buffer indicates the start of a media segment, set append state to PARSING_MEDIA_SEGMENT. Jump to the loop top step above. If the input buffer does not contain a complete initialization segment yet, then jump to the need more data step below. Run the initialization segment received algorithm. Remove the initialization segment bytes from the beginning of the input buffer. Set append state to WAITING_FOR_SEGMENT. If the first initialization segment received flag is false, then run the append error algorithm with the decode error parameter set to true and abort this algorithm. If the input buffer contains one or more complete coded frames, then run the coded frame processing algorithm. The frequency at which the coded frame processing algorithm is run is implementation-specific. The coded frame processing algorithm may be called when the input buffer contains the complete media segment or it may be called multiple times as complete coded frames are added to the input buffer. If this SourceBuffer is full and cannot accept more media data, then set the buffer full flag to true. If the input buffer does not contain a complete media segment, then jump to the need more data step below. Remove the media segment bytes from the beginning of the input buffer. Need more data: Return control to the calling algorithm. If the append state equals PARSING_MEDIA_SEGMENT and the input buffer contains some complete coded frames, then run the coded frame processing algorithm until all of these complete coded frames have been processed. Unset the last decode timestamp on all track buffers. Unset the last frame duration on all track buffers. Unset the highest end timestamp on all track buffers. Set the need random access point flag on all track buffers to true. Remove all bytes from the input buffer. This algorithm is called when an error occurs during an append. This algorithm takes a decode error parameter that indicates whether endOfStream() should be called. Queue a task to fire a simple event named error at this SourceBuffer object. If decode error is true, then run the end of stream algorithm with the error parameter set to "decode". When an append operation begins, the follow steps are run to validate and prepare the SourceBuffer. If the SourceBuffer has been removed from the sourceBuffers attribute of the parent media source then throw an InvalidStateError exception and abort these steps. If the HTMLMediaElement.error attribute is not null, then throw an InvalidStateError exception and abort these steps. Run the coded frame eviction algorithm. If the buffer full flag equals true, then throw a QuotaExceededError exception and abort these step. This is the signal that the implementation was unable to evict enough data to accomodate the append or the append is too big. The web application should use remove() to explicitly free up space and/or reduce the size of the append. When appendBuffer() is called, the following steps are run to process the appended data. Run the segment parser loop algorithm. If the segment parser loop algorithm in the previous step was aborted, then abort this algorithm. Queue a task to fire a simple event named update at this SourceBuffer object. This algorithm is invoked by appendStream()to transfer data from a ReadableStream to the SourceBuffer. This algorithm is initialized with the stream and maxSize parameters from the appendStream() call. If maxSize is set, then let bytesLeft equal maxSize. Loop Top: If maxSize is set and bytesLeft equals 0, then jump to the loop done step below. Wait for either the stream.ready promise or the stream.closed promise to be resolved or rejected. This is intended to be similar to Promise.race([stream.ready, stream.closed], continueAppendLoop, continueAppendLoop), where the continueAppendLoop function returns control to this algorithm and starts executing the step that follows this one. If the stream append loop algorithm is aborted while waiting for the promises, continueAppendLoop must not continue the algorithm when it is eventually called. Continue onto the next step. If stream.state equals "closed", then jump to the loop done step below. If stream.state equals "errored", then run the append error algorithm with the decode error parameter set to false and abort this algorithm. If stream.state does not equal "readable", then run the append error algorithm with the decode error parameter set to false and abort this algorithm. Let data be the value returned by a call to stream.read(). If data is not an ArrayBuffer or an ArrayBufferView then, run the append error algorithm with the decode error parameter set to false and abort this algorithm. Let new data equal the value returned by calling data.slice(0, bytesLeft). This step and the next one are assuming data is an ArrayBuffer. If data is an ArrayBufferView subarray() should be called instead. Let remaining data equal the value returned by calling data.slice(bytesLeft). Push remaining data back onto the front of stream so it will be returned by the next stream.read() call. Assign new data to data. If the buffer full flag equals true, then run the append error algorithm with the decode error parameter set to false and abort this algorithm. The web application should use remove() to free up space in the SourceBuffer. Loop Done: Set the updating attribute to false. Let start equal the starting presentation timestamp for the removal range. Let end equal the end presentation timestamp for the removal range. Return control to the caller and run the rest of the steps asynchronously. Run the coded frame removal algorithm with start and end as the start and end of the removal range. Each SourceBuffer object has an internal first initialization segment received flag that tracks whether the first initialization segment has been appended and received by this algorithm. This flag is set to false when the SourceBuffer is created and updated by the algorithm below. Run the duration change algorithm with new duration set to the duration in the initialization segment. Run the duration change algorithm with new duration set to positive Infinity. If the initialization segment has no audio, video, or text tracks, then run the append error algorithm with the decode error parameter set to true and abort these steps. Verify the following properties. If any of the checks fail then run the append error algorithm with the decode error parameter set to true and abort these steps. The number of audio, video, and text tracks match what was in the first initialization segment. The codecs for each track, match what was specified in the first initialization segment. If more than one track for a single type are present (ie 2 audio tracks), then the Track IDs match the ones in the first initialization segment. Add the appropriate track descriptions from this initialization segment to each of the track buffers. Let active track flag equal false. If the initialization segment contains tracks with codecs the user agent does not support, then run the append error algorithm with the decode error parameter set to true and abort these steps. User agents may consider codecs, that would otherwise be supported, as "not supported" here if the codecs were not specified in the type parameter passed to addSourceBuffer(). For example, MediaSource.isTypeSupported('video/webm;codecs="vp8,vorbis"') may return true, but if addSourceBuffer() was called with 'video/webm;codecs="vp8"' and a Vorbis track appears in the initialization segment, then the user agent may use this step to trigger a decode error. Let audio byte stream track ID be the Track ID for the current track being processed. Let audio language be a BCP 47 language tag for the language specified in the initialization segment for this track or an empty string if no language info is present. If audio language equals an empty string or the 'und' BCP 47 value, then run the default track language algorithm with byteStreamTrackID set to audio byte stream track ID and type set to "audio" and assign the value returned by the algorithm to audio language. Let audio label be a label specified in the initialization segment for this track or an empty string if no label info is present. If audio label equals an empty string, then run the default track label algorithm with byteStreamTrackID set to audio byte stream track ID and type set to "audio" and assign the value returned by the algorithm to audio label. Let audio kinds be an array of kind strings specified in the initialization segment for this track or an empty array if no kind information is provided. If audio kinds equals an empty array, then run the default track kinds algorithm with byteStreamTrackID set to audio byte stream track ID and type set to "audio" and assign the value returned by the algorithm to audio kinds. Let current audio kind equal the value from audio kinds for this iteration of the loop. Let new audio track be a new AudioTrack object. Generate a unique ID and assign it to the id property on new audio track. Assign audio language to the language property on new audio track. Assign audio label to the label property on new audio track. Assign current audio kind to the kind property on new audio track. Set the enabled property on new audio track to true. Set active track flag to true. Add new audio track to the audioTracks attribute on this SourceBuffer object. Queue a task to fire a trusted event named addtrack, that does not bubble and is not cancelable, and that uses the TrackEvent interface, at the AudioTrackList object referenced by the audioTracks attribute on this SourceBuffer object. Add new audio track to the audioTracks attribute on the HTMLMediaElement. Queue a task to fire a trusted event named addtrack, that does not bubble and is not cancelable, and that uses the TrackEvent interface, at the AudioTrackList object referenced by the audioTracks attribute on the HTMLMediaElement. Create a new track buffer to store coded frames for this track. Add the track description for this track to the track buffer. Let video byte stream track ID be the Track ID for the current track being processed. Let video language be a BCP 47 language tag for the language specified in the initialization segment for this track or an empty string if no language info is present. If video language equals an empty string or the 'und' BCP 47 value, then run the default track language algorithm with byteStreamTrackID set to video byte stream track ID and type set to "video" and assign the value returned by the algorithm to video language. Let video label be a label specified in the initialization segment for this track or an empty string if no label info is present. If video label equals an empty string, then run the default track label algorithm with byteStreamTrackID set to video byte stream track ID and type set to "video" and assign the value returned by the algorithm to video label. Let video kinds be an array of kind strings specified in the initialization segment for this track or an empty array if no kind information is provided. If video kinds equals an empty array, then run the default track kinds algorithm with byteStreamTrackID set to video byte stream track ID and type set to "video" and assign the value returned by the algorithm to video kinds. Let current video kind equal the value from video kinds for this iteration of the loop. Let new video track be a new VideoTrack object. Generate a unique ID and assign it to the id property on new video track. Assign video language to the language property on new video track. Assign video label to the label property on new video track. Assign current video kind to the kind property on new video track. Set the selected property on new video track to true. Add new video track to the videoTracks attribute on this SourceBuffer object. Queue a task to fire a trusted event named addtrack, that does not bubble and is not cancelable, and that uses the TrackEvent interface, at the VideoTrackList object referenced by the videoTracks attribute on this SourceBuffer object. Add new video track to the videoTracks attribute on the HTMLMediaElement. Queue a task to fire a trusted event named addtrack, that does not bubble and is not cancelable, and that uses the TrackEvent interface, at the VideoTrackList object referenced by the videoTracks attribute on the HTMLMediaElement. Let text byte stream track ID be the Track ID for the current track being processed. Let text language be a BCP 47 language tag for the language specified in the initialization segment for this track or an empty string if no language info is present. If text language equals an empty string or the 'und' BCP 47 value, then run the default track language algorithm with byteStreamTrackID set to text byte stream track ID and type set to "text" and assign the value returned by the algorithm to text language. Let text label be a label specified in the initialization segment for this track or an empty string if no label info is present. If text label equals an empty string, then run the default track label algorithm with byteStreamTrackID set to text byte stream track ID and type set to "text" and assign the value returned by the algorithm to text label. Let text kinds be an array of kind strings specified in the initialization segment for this track or an empty array if no kind information is provided. If text kinds equals an empty array, then run the default track kinds algorithm with byteStreamTrackID set to text byte stream track ID and type set to "text" and assign the value returned by the algorithm to text kinds. Let current text kind equal the value from text kinds for this iteration of the loop. Let new text track be a new TextTrack object. Generate a unique ID and assign it to the id property on new text track. Assign text language to the language property on new text track. Assign text label to the label property on new text track. Assign current text kind to the kind property on new text track. Populate the remaining properties on new text track with the appropriate information from the initialization segment. If the mode property on new text track equals "showing" or "hidden", then set active track flag to true. Add new text track to the textTracks attribute on this SourceBuffer object. Queue a task to fire a trusted event named addtrack, that does not bubble and is not cancelable, and that uses the TrackEvent interface, at textTracks attribute on this SourceBuffer object. Add new text track to the textTracks attribute on the HTMLMediaElement. Queue a task to fire a trusted event named addtrack, that does not bubble and is not cancelable, and that uses the TrackEvent interface, at the TextTrackList object referenced by the textTracks attribute on the HTMLMediaElement. Add this SourceBuffer to activeSourceBuffers. Set first initialization segment received flag to true. If one or more objects in sourceBuffers have first initialization segment received flag set to false, then abort these steps. Queue a task to fire a simple event named loadedmetadata at the media element. If the active track flag equals true and the HTMLMediaElement.readyState attribute is greater than HAVE_CURRENT_DATA, then set the HTMLMediaElement.readyState attribute to HAVE_METADATA. The following steps are run when the initialization segment received algorithm needs to determine what the default language for a new track should be. This algorithm is initialized with byteStreamTrackID and type parameters when invoked by the initialization segment received algorithm. If trackDefaults contains a TrackDefault object with a type attribute equal to type and a byteStreamTrackID attribute equal to byteStreamTrackID, then return the value of the language attribute on this matching object and abort these steps. If trackDefaults contains a TrackDefault object with a type attribute equal to type and a byteStreamTrackID attribute equal to an empty string, then return the value of the language attribute on this matching object and abort these steps. Return an empty string to the caller. The following steps are run when the initialization segment received algorithm needs to determine what the default label for a new track should be. This algorithm is initialized with byteStreamTrackID and type parameters when invoked by the initialization segment received algorithm. If trackDefaults contains a TrackDefault object with a type attribute equal to type and a byteStreamTrackID attribute equal to byteStreamTrackID, then return the value of the label attribute on this matching object and abort these steps. If trackDefaults contains a TrackDefault object with a type attribute equal to type and a byteStreamTrackID attribute equal to an empty string, then return the value of the label attribute on this matching object and abort these steps. The following steps are run when the initialization segment received algorithm needs to determine what the default kinds for a new track should be. This algorithm is initialized with byteStreamTrackID and type parameters when invoked by the initialization segment received algorithm. If trackDefaults contains a TrackDefault object with a type attribute equal to type and a byteStreamTrackID attribute equal to byteStreamTrackID, then return the value of the kinds attribute on this matching object and abort these steps. If trackDefaults contains a TrackDefault object with a type attribute equal to type and a byteStreamTrackID attribute equal to an empty string, then return the value of the kinds attribute on this matching object and abort these steps. Return an array with a single empty string element in it to the caller. Let presentation timestamp equal 0. Let decode timestamp equal 0. Let presentation timestamp be a double precision floating point representation of the coded frame's presentation timestamp in seconds. Special processing may be needed to determine the presentation and decode timestamps for timed text frames since this information may not be explicitly present in the underlying format or may be dependent on the order of the frames. Some metadata text tracks, like MPEG2-TS PSI data, may only have implied timestamps. Format specific rules for these situations should be in the byte stream format specifications or in separate extension specifications. Let decode timestamp be a double precision floating point representation of the coded frame's decode timestamp in seconds. Implementations don't have to internally store timestamps in a double precision floating point representation. This representation is used here because it is the represention for timestamps in the HTML spec. The intention here is to make the behavior clear without adding unnecessary complexity to the algorithm to deal with the fact that adding a timestampOffset may cause a timestamp rollover in the underlying timestamp representation used by the byte stream format. Implementations can use any internal timestamp representation they wish, but the addition of timestampOffset should behave in a similar manner to what would happen if a double precision floating point representation was used. Let frame duration be a double precision floating point representation of the coded frame's duration in seconds. Set timestampOffset equal to group start timestamp - presentation timestamp. Set group end timestamp equal to group start timestamp. Add timestampOffset to the presentation timestamp. Add timestampOffset to the decode timestamp. Let track buffer equal the track buffer that the coded frame will be added to. Set group end timestamp to presentation timestamp. Set group start timestamp equal to the group end timestamp. Jump to the Loop Top step above to restart processing of the current coded frame. Let frame end timestamp equal the sum of presentation timestamp and frame duration. If presentation timestamp is less than appendWindowStart, then set the need random access point flag to true, drop the coded frame, and jump to the top of the loop to start processing the next coded frame. Some implementations may choose to collect some of these coded frames that are outside the append window and use them to generate a splice at the first coded frame that has a presentation timestamp greater than or equal to appendWindowStart even if that frame is not a random access point. Supporting this requires multiple decoders or faster than real-time decoding so for now this behavior will not be a normative requirement. If frame end timestamp is greater than appendWindowEnd, then set the need random access point flag to true, drop the coded frame, and jump to the top of the loop to start processing the next coded frame. If the coded frame is not a random access point, then drop the coded frame and jump to the top of the loop to start processing the next coded frame. Set the need random access point flag on track buffer to false. Let overlapped frame be the coded frame in track buffer that matches the condition above. Run the audio splice frame algorithm and if a splice frame is returned, assign it to spliced audio frame. Let remove window timestamp equal the overlapped frame presentation timestamp plus 1 microsecond. If the presentation timestamp is less than the remove window timestamp, then remove overlapped frame from track buffer. This is to compensate for minor errors in frame timestamp computations that can appear when converting back and forth between double precision floating point numbers and rationals. This tolerance allows a frame to replace an existing one as long as it is within 1 microsecond of the existing frame's start time. Frames that come slightly before an existing frame are handled by the removal step below. Run the text splice frame algorithm and if a splice frame is returned, assign it to spliced timed text frame. Remove all coded frames from track buffer that have a presentation timestamp greater than or equal to presentation timestamp and less than frame end timestamp. Remove all possible decoding dependencies on the coded frames removed in the previous two steps by removing all coded frames from track buffer between those frames removed in the previous two steps and the next random access point after those removed frames. Removing all coded frames until the next random access point is a conservative estimate of the decoding dependencies since it assumes all frames between the removed frames and the next random access point depended on the frames that were removed. Add spliced audio frame to the track buffer. Add spliced timed text frame to the track buffer. Add the coded frame with the presentation timestamp, decode timestamp, and frame duration to the track buffer. Set last decode timestamp for track buffer to decode timestamp. Set last frame duration for track buffer to frame duration. If highest end timestamp for track buffer is unset or frame end timestamp is greater than highest end timestamp, then set highest end timestamp for track buffer to frame end timestamp. The greater than check is needed because bidirectional prediction between coded frames can cause presentation timestamp to not be monotonically increasing eventhough the decode timestamps are monotonically increasing. If frame end timestamp is greater than group end timestamp, then set group end timestamp equal to frame end timestamp. If generate timestamps flag equals true, then set timestampOffset equal to frame end timestamp. Queue a task to fire a simple event named canplay at the media element. If the media segment contains data beyond the current duration, then run the duration change algorithm with new duration set to the maximum of the current duration and the group end timestamp. Let start be the starting presentation timestamp for the removal range. Let end be the end presentation timestamp for the removal range. If this track buffer has a random access point timestamp that is greater than or equal to end, then update remove end timestamp to that random access point timestamp. Random access point timestamps can be different across tracks because the dependencies between coded frames within a track are usually different than the dependencies in another track. Remove all media data, from this track buffer, that contain starting timestamps greater than or equal to start and less than the remove end timestamp. Remove all possible decoding dependencies on the coded frames removed in the previous step by removing all coded frames from this track buffer between those frames removed in the previous step and the next random access point after those removed frames. If this object is in activeSourceBuffers, the current playback position is greater than or equal to start and less than the remove end timestamp, and HTMLMediaElement.readyState is greater than HAVE_METADATA, then set the HTMLMediaElement.readyState attribute to HAVE_METADATA and stall playback. This transition occurs because media data for the current position has been removed. Playback cannot progress until media for the current playback position is appended or the selected/enabled tracks change. If buffer full flag equals true and this object is ready to accept more bytes, then set the buffer full flag to false. This algorithm is run to free up space in this source buffer when new data is appended. Let new data equal the data that is about to be appended to this SourceBuffer. If the buffer full flag equals false, then abort these steps. Let removal ranges equal a list of presentation time ranges that can be evicted from the presentation to make room for the new data. Implementations may use different methods for selecting removal ranges so web applications should not depend on a specific behavior. The web application can use the buffered attribute to observe whether portions of the buffered data have been evicted. For each range in removal ranges, run the coded frame removal algorithm with start and end equal to the removal range start and end timestamp respectively. Let track buffer be the track buffer that will contain the splice. Let new coded frame be the new coded frame, that is being added to track buffer, which triggered the need for a splice. Let decode timestamp be the decode timestamp for new coded frame. Let frame duration be the coded frame duration of new coded frame. Let overlapped frame be the coded frame in track buffer with a presentation interval that contains presentation timestamp. Update presentation timestamp and decode timestamp to the nearest audio sample timestamp based on sample rate of the audio in overlapped frame. If a timestamp is equidistant from both audio sample timestamps, then use the higher timestamp. (eg. floor(x * sample_rate + 0.5) / sample_rate). The presentation timestamp of overlapped frame equals 10. Remove overlapped frame from track buffer. The presentation timestamp set to the overlapped frame presentation timestamp. The decode timestamp set to the overlapped frame decode timestamp. The coded frame duration set to difference between presentation timestamp and the overlapped frame presentation timestamp. Some implementations may apply fades to/from silence to coded frames on either side of the inserted silence to make the transition less jarring. Return to caller without providing a splice frame. This is intended to allow new coded frame to be added to the track buffer as if overlapped frame had not been in the track buffer to begin with. Let splice end timestamp equal the sum of presentation timestamp and the splice duration of 5 milliseconds. Let fade out coded frames equal overlapped frame as well as any additional frames in track buffer that have a presentation timestamp greater than presentation timestamp and less than splice end timestamp. Remove all the frames included in fade out coded frames from track buffer. The coded frame duration set to difference between frame end timestamp and the overlapped frame presentation timestamp. The fade out coded frames equals fade-out coded frames. The fade in coded frame equal new coded frame. 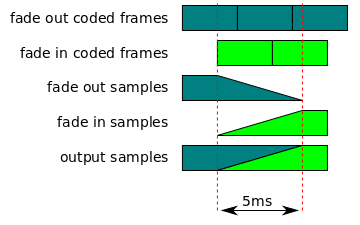 If the new coded frame is less than 5 milliseconds in duration, then coded frames that are appended after the new coded frame will be needed to properly render the splice. The splice timestamp equals presentation timestamp. See the audio splice rendering algorithm for details on how this splice frame is rendered. Let fade out coded frames be the coded frames that are faded out during the splice. Let fade in coded frames be the coded frames that are faded in during the splice. Let presentation timestamp be the presentation timestamp of the first coded frame in fade out coded frames. Let end timestamp be the sum of the presentation timestamp and the coded frame duration of the last frame in fade in coded frames. Let splice timestamp be the presentation timestamp where the splice starts. This corresponds with the presentation timestamp of the first frame in fade in coded frames. Let splice end timestamp equal splice timestamp plus five milliseconds. Let fade out samples be the samples generated by decoding fade out coded frames. Trim fade out samples so that it only contains samples between presentation timestamp and splice end timestamp. Let fade in samples be the samples generated by decoding fade in coded frames. If fade out samples and fade in samples do not have a common sample rate and channel layout, then convert fade out samples and fade in samples to a common sample rate and channel layout. Let output samples be a buffer to hold the output samples. Apply a linear gain fade out with a starting gain of 1 and an ending gain of 0 to the samples between splice timestamp and splice end timestamp in fade out samples. Apply a linear gain fade in with a starting gain of 0 and an ending gain of 1 to the samples between splice timestamp and splice end timestamp in fade in samples. Copy samples between presentation timestamp to splice timestamp from fade out samples into output samples. For each sample between splice timestamp and splice end timestamp, compute the sum of a sample from fade out samples and the corresponding sample in fade in samples and store the result in output samples. Copy samples between splice end timestamp to end timestamp from fade in samples into output samples. Here is a graphical representation of this algorithm. Let first overlapped frame be the coded frame in track buffer with a presentation interval that contains presentation timestamp. Let overlapped presentation timestamp be the presentation timestamp of the first overlapped frame. Let overlapped frames equal first overlapped frame as well as any additional frames in track buffer that have a presentation timestamp greater than presentation timestamp and less than frame end timestamp. Remove all the frames included in overlapped frames from track buffer. Update the coded frame duration of the first overlapped frame to presentation timestamp - overlapped presentation timestamp. Add first overlapped frame to the track buffer. This is intended to allow new coded frame to be added to the track buffer as if it hadn't overlapped any frames in track buffer to begin with. SourceBufferList is a simple container object for SourceBuffer objects. It provides read-only array access and fires events when the list is modified. Indicates the number of SourceBuffer objects in the list. The event handler for the addsourcebuffer event. The event handler for the removesourcebuffer event. Allows the SourceBuffer objects in the list to be accessed with an array operator (i.e. ). If index is greater than or equal to the length attribute then return undefined and abort these steps. Return the index'th SourceBuffer object in the list. addsourcebuffer Event When a SourceBuffer is added to the list. removesourcebuffer Event When a SourceBuffer is removed from the list. The total number of corrupted frames that have been detected. The timestamp returned by Performance.now() when this object was created. The total number of frames dropped predecode or dropped because the frame missed its display deadline. The sum of all displayed frame delays for all displayed frames. (i.e., Frames included in the totalVideoFrames count, but not in the droppedVideoFrames count. The total number of frames that would have been displayed if no frames are dropped. The TrackDefault object is used to provide kind, label, and language information for tracks that do not contain this information in the initialization segments. This information is only consulted when the initialization segment received algorithm creates track objects. audio Indicates that the information in the TrackDefault object should only be used when creating AudioTrack objects. video Indicates that the information in the TrackDefault object should only be used when creating VideoTrack objects. text Indicates that the information in the TrackDefault object should only be used when creating TextTrack objects. If language is not an empty string and language is not a BCP 47 language tag, then throw a TypeError and abort these steps. If any string in kinds contains a value that is not listed as applying to audio in the kind categories table, then throw a TypeError and abort these steps. If any string in kinds contains a value that is not listed as applying to video in the kind categories table, then throw a TypeError and abort these steps. If any string in kinds contains a value that is not listed in the text track kind list, then throw a TypeError and abort these steps. Set the type attribute on this new object to type. Set the language attribute on this new object to language. Set the label attribute on this new object to label. Set the kinds attribute to on this new object kinds. Set the byteStreamTrackID attribute on this new object to byteStreamTrackID. The decimal string representation of the Track ID that identifies the specific track that this object should apply to. An empty string indicates that this object can be used for any track of the appropriate type. (i.e. any AudioTrack if type equals "audio"). The default kinds used when an initialization segment does not contain kind information for a new track. See initialization segment received algorithm for details. The default label to use when an initialization segment does not contain label information for a new track. See initialization segment received algorithm for details. The default language to use when an initialization segment does not contain language information for a new track. See initialization segment received algorithm for details. The type of track that can be constructed using the information in this object. TrackDefaultList is a simple container object for TrackDefault objects. It provides read-only array access. If trackDefaults contains two or more TrackDefault objects with the same type and the same byteStreamTrackID, then throw a TypeError and abort these steps. This also applies when byteStreamTrackID contains an empty string and ensures that there is only one "byteStreamTrackID independent" default for each TrackDefaultType value. Store a shallow copy of trackDefaults in this new object so the values can be returned by the accessor methods. Indicates the number of TrackDefault objects in the list. Allows the TrackDefault objects in the list to be accessed with an array operator (i.e. ). Return the index'th TrackDefault object in the list. This section specifies extensions to the URL[ FILE-API ] object definition. Creates URLs for MediaSource objects. This algorithm is intended to mirror the behavior of the createObjectURL()[ FILE-API ] method with autoRevoke set to true. Return a unique MediaSource object URL that can be used to dereference the mediaSource argument, and run the rest of the algorithm asynchronously. Revoke the MediaSource object URL by calling revokeObjectURL() on it. This section specifies what existing attributes on the HTMLMediaElement must return when a MediaSource is attached to the element. Return an empty TimeRanges object. If the HTMLMediaElement.buffered attribute returns an empty TimeRanges object, then return an empty TimeRanges object and abort these steps. Return a single range with a start time of 0 and an end time equal to the highest end time reported by the HTMLMediaElement.buffered attribute. Return a single range with a start time of 0 and an end time equal to duration. The HTMLMediaElement.buffered attribute returns a static normalized TimeRanges object based on the following steps. Let intersection ranges equal an empty TimeRanges object. Let active ranges be the ranges returned by buffered for each SourceBuffer object in activeSourceBuffers. Let highest end time be the largest range end time in the active ranges. Let source ranges equal the ranges returned by the buffered attribute on the current SourceBuffer. If readyState is "ended", then set the end time on the last range in source ranges to highest end time. Let new intersection ranges equal the intersection between the intersection ranges and the source ranges. If the current value of this attribute has not been set by this algorithm or intersection ranges does not contain the exact same range information as the current value of this attribute, then update the current value of this attribute to intersection ranges. This section specifies new attributes and internal state that are being added to the HTMLVideoElement. Each HTMLVideoElement will maintain a total video frame count variable that keeps track of the total number of frames that have been displayed and dropped. This variable is initialized to 0 when the element is created and whenever the media element load algorithm is invoked. It is incremented when a video frame is displayed or when the dropped video frame count is incremented. Each HTMLVideoElement will maintain a dropped video frame count variable that keeps track of the total number of frames that have been dropped. This variable is initialized to 0 when the element is created and whenever the media element load algorithm is invoked. It is incremented when a video frame is dropped predecode or when a frame is decoded but dropped because it missed a display deadline. Each HTMLVideoElement will maintain a corrupted video frame count variable that keeps track of the total number of corrupted frames detected. This variable is initialized to 0 when the element is created and whenever the media element load algorithm is invoked. It is incremented when a corrupted video frame is detected by the decoder. It is up to the implementation to determine whether to display or drop a corrupted frame. Whichever choice is made, the total video frame count and dropped video frame count must be updated appropriately. Each HTMLVideoElement will maintain a displayed frame delay sum variable that keeps track of the sum of all displayed frame delays. This variable is initialized to 0 when the element is created and whenever the media element load algorithm is invoked. When a frame is displayed, its displayed frame delay is computed and added to this variable. Provides the current the playback quality metrics. Let playbackQuality be a new instance of VideoPlaybackQuality. Set playbackQuality.creationTime to the value returned by a call to Performance.now(). Set playbackQuality.totalVideoFrames to the current value of the total video frame count. Set playbackQuality.droppedVideoFrames to the current value of the dropped video frame count. Set playbackQuality.corruptedVideoFrames to the current value of the corrupted video frame count. Set playbackQuality.totalFrameDelay to the current value of the displayed frame delay sum. This section specifies extensions to the HTML AudioTrack definition. Returns the SourceBuffer that created this track. Returns null if this track was not created by a SourceBuffer or the SourceBuffer has been removed from the sourceBuffers attribute of its parent media source. This section specifies extensions to the HTML VideoTrack definition. This section specifies extensions to the HTML TextTrack definition. The bytes provided through appendBuffer() and appendStream() for a SourceBuffer form a logical byte stream. The format and semantics of these byte streams are defined in byte stream format specifications. The byte stream format registry [ MSE-REGISTRY ] provides mappings between a MIME type that may be passed to addSourceBuffer() or isTypeSupported() and the byte stream format expected by a SourceBuffer created with that MIME type. Implementations are encouraged to register mappings for byte stream formats they support to facilitate interoperability. The byte stream format registry [ MSE-REGISTRY ] is the authoritative source for these mappings. If an implementation claims to support a MIME type listed in the registry, its SourceBuffer implementation must conform to the byte stream format specification listed in the registry entry. The byte stream format specifications in the registry are not intended to define new storage formats. They simply outline the subset of existing storage format structures that implementations of this specification will accept. Byte stream format parsing and validation is implemented in the segment parser loop algorithm. A byte stream format specification must define initialization segments and media segments. A byte stream format should provide references for sourcing AudioTrack, VideoTrack, and TextTrack attribute values from data in initialization segments. If the byte stream format covers a format similar to one covered in the in-band tracks spec [ INBANDTRACKS ], then it should try to use the same attribute mappings so that Media Source Extensions playback and non-Media Source Extensions playback provide the same track information. It must be possible to identify segment boundaries and segment type (initialization or media) by examining the byte stream alone. The number and type of tracks are not consistent. For example, if the first initialization segment has 2 audio tracks and 1 video track, then all initialization segments that follow it in the byte stream must describe 2 audio tracks and 1 video track. Track IDs are not the same across initialization segments, for segments describing multiple tracks of a single type. (e.g. 2 audio tracks). Codecs changes across initialization segments. For example, a byte stream that starts with an initialization segment that specifies a single AAC track and later contains an initialization segment that specifies a single AMR-WB track is not allowed. Support for multiple codecs is handled with multiple SourceBuffer objects. Track IDs changing across initialization segments if the segments describes only one track of each type. Video frame size changes. The user agent must support seamless playback. This will cause the <video> display region to change size if the web application does not use CSS or HTML attributes (width/height) to constrain the element size. Audio channel count changes. The user agent may support this seamlessly and could trigger downmixing. This is a quality of implementation issue because changing the channel count may require reinitializing the audio device, resamplers, and channel mixers which tends to be audible. Map all timestamps to the same media timeline. Support seamless playback of media segments having a timestamp gap smaller than the audio frame size. User agent must not reflect these gaps in the buffered attribute. This is intended to simplify switching between audio streams where the frame boundaries don't always line up across encodings (e.g. Vorbis). The number and type (audio, video, text, etc.) of all tracks in the media segments are not identified. The decoding capabilities needed to decode each track (i.e. codec and codec parameters) are not provided. Encryption parameters necessary to decrypt the content (except the encryption key itself) are not provided for all encrypted tracks. Information that determines the intrinsic width and height of the video (specifically, this requires either the picture or pixel aspect ratio, together with the encoded resolution). Information necessary to compute the global presentation timestamp of every sample in the sequence of media segments is not provided. For example, if I1 is associated with M1, M2, M3 then the above must hold for all the combinations I1+M1, I1+M2, I1+M1+M2, I1+M2+M3, etc. Byte stream specifications must at a minimum define constraints which ensure that the above requirements hold. Additional constraints may be defined, for example to simplify implementation. // Error fetching the initialization segment. Signal end of stream with an error. // Append the initialization segment. // Append some initial media data. // If we have run out of stream data, then signal end of stream. // Make sure the previous append is not still pending. // Error fetching the next media segment. // should be prepared to handle multiple “sourceopen” events. // Abort current segment append. // Append a media segment from the new playback position. The editors would like to thank Alex Giladi, Bob Lund, Chris Poole, Cyril Concolato, David Dorwin, David Singer, Duncan Rowden, Frank Galligan, Glenn Adams, Jer Noble, Joe Steele, John Simmons, Kevin Streeter, Mark Vickers, Matt Ward, Matthew Gregan, Michael Thornburgh, Philip Jägenstedt, Pierre Lemieux, Ralph Giles, Steven Robertson, and Tatsuya Igarashi for their contributions to this specification. Issue 19, 20 & 26 - Resolved problems with Duration Changes and Range Removals. Separated Range Removals from Duration Changes, required separate remove(). Disabled abort on Range Removals. Issue 66 - Add EventHandler attributes to MediaSource, SourceBuffer, and SourceBufferList. Minor whitespace and typo fixes. Issue 54 - Clarified use of Presentation Time Stamps (PTS) for buffered. Issue 17 - Generalize the detach MediaSource algorithm for media element load. Issue 18 - Generalize the detach MediaSource algorithm for media element fetch algorithm failures. Issue 25 - Fixed ambiguous behavior with CFP algorithm. Issue 11 - Ignore preload attribute on parent media element. Corrected the editor's draft publish date. Minor whitespace fixes for source readability. Added missing links in recent revision history. Issue 34 - Replace InvalidAccessError usage with TypeError. Fixed unexpected tag errors from previous changes. Issue 23 - Require setting a random access point to prevent the coded frame removal algorithm from introducing a discontinuity at end of current coded frame group. Issue 30 - Remove unnecessary segment parser loop step referencing undefined media segment header. Issue 12 - Update bug tracker links to use github. Bug 29133 - Maintain coded group continuity in sequence append mode when resetting parser state. Bugs 28881 and 28882 - Editorial punctuation and whitespace fixes. Also replaced tabs with spaces and removed spaces at end of line and before periods and commas. Bug 28234 - Rename highest presentation timestamp to highest end timestamp and clarify definition. Bug 28209 - Remove redundant definition of overlapped frame presentation timestamp. Bug 27790 - Make .buffered attributes return the same object if nothing has changed. Bug 27857 - Make the 'removed from the sourceBuffers' checks in remove() and .mode setter consistent with other algorithms. Bug 27649 - Clarify that setting the duration in the detach algorithm does not run the attribute set algorithm. Bug 27599 - Make TrackDefaultList constructor parameter optional and have a default value of . Bug 27758 - Add informative reference to INBANDTRACKS and track attribute sourcing requirements. Bug 27559 - Clarify that the TrackDefaultList constructor does a shallow copy. Bug 27548 - Reroute decode errors through the append error algorithm. Bug 27542 - Prevent SourceBuffer monitoring algorithm from triggering a HAVE_NOTHING to HAVE_METADATA transition. Bug 27239 - Updated appendStream() to use the new Streams API. Bug 27487 - Removed negative decode timestamp check from coded frame processing algorithm. Bug 27342 - Changed prepare append algorithm to throw an exception if HTMLMediaElement.error is not null. Update all links in the revision history to point to GitHub. Changed Editor's draft link to point to GitHub. Bug 27353 - Convert exceptions from xxx_ERR to xxxError form. Changed broken exception links to point to HTML5 instead of WHATWG DOM. Bug 27352 - Changed TrackDefault constructor to throw a TypeError instead of an InvalidAccessError for invalid kinds. Bug 27318 - Fix length attribute link in TrackBufferList getter method. Bug 27296 - Clarify .seekable when duration is Infinity and .buffered is empty. Bug 27241 - Fixed step 1 of the TrackDefault constructor so it doesn't always throw an exception. Bug 27240 - Make TrackDefaultList contructor throw an exception on any duplicate (type, byteStreamTrackID) pair. Bug 27174 - Added SourceBuffer configuration definition to clarify addSourceBuffer() behavior. Bug 26924 - Run default language algorithm if 'und' BCP 47 value is present in the init segment. Bug 26932 - Fix TrackDefault constructor kinds parameter type. Bug 26777 - Rename 'first initialization segment flag' to 'first initialization segment received flag'. Bug 26721 - Add label attribute to TrackDefault object. Bug 26436 - Use HTMLMediaElement.buffered for HTMLMediaElement.readyState transitions instead of individual SourceBuffer.buffered attributes. Bug 26345 - Make activeSourceBuffers order match sourceBuffers order. Bug 26316 - Changed duration change algorithm to avoid open transition on endOfStream(). Bug 26314 - Fixed coded frame removal algorithm to remove dependencies that may lie outside the removal range. Bug 26032 - Set need random access point flag on all track buffers when a new init segment is received. Bug 25845 - Clarify SourceBuffer.buffered getter behavior. Bug 25995 - Fix conditions in "remove existing coded frames" step. Bug 25999 - Change appendWindowStart assignments to reference presentation start time. Bug 26000 - Make it explicit that SourceBuffer.remove() throws an exception if duration equals NaN. Bug 25846 - Update end of stream algorithm to invoke the append error algorithm on decode errors. Bug 25850 - Specify SourceBuffer.trackDefaults initial value and setter/getter behavior. Bug 25998 - Move presentation & decode timestamp checks after append window filtering steps. Bug 24370 - Add TrackDefault object and remove kind/language overloads. Bug 25518 - Make remove() end parameter an unrestricted double. Bug 25580 - Add informative reference to byte stream format registry. Bug 25347 - Remove unnecessary null & invalid enum value checks. Bug 25505 - Introduce "generate timestamps flag" to handle MPEG audio timestamp generation. Bug 25157 - Fix typo in coded frame duration example. Bug 24820 - Renamed highest presentation end timestamp to group end timestamp and fixed a few related issues. Bug 24347 - Fix HAVE_FUTURE_DATA transition condition in SourceBuffer monitoring algorithm. Bug 23169 - Restore totalFrameDelay units to seconds. Bug 23989 - Update blob URL origin text to remove stale File API reference. Bug 23818 - Make external spec references normative. Bug 23441 - Update byte stream format registry text. Bug 23169 - Update totalFrameDelay text. Bug 23663 - Clarify seeking behavior in Section 2.4.3. Bug 23441 - Established MSE byte stream format registry and extracted byte stream format text into separate documents. Bug 23553 - Fixed segment parser loop so it doesn't appear to prematurely remove the media segment header. Bug 23557 - Update SPS/PPS note to not explicitly recommend specific avc versions. Bug 23549 - Add definitions for decode timestamp, presentation timestamp, an presentation order. Bug 23554 - Introduced presentation interval and coded frame duration terms to clarify text. Bug 23525 - Fix mvex box error behavior. Bug 23442 - Fix example to work when seeking in the 'ended' state. Bug 22136 - Added text for Inband SPS/PPS support. Bug 22776 - Clarified that implementations are only required to support one SourceBuffer configuration at a time. Bug 22117 - Reword byte stream specs in terms of UA behavior. Bug 22148 - Replace VideoPlaybackQuality.playbackJitter with VideoPlaybackQuality.totalFrameDelay. Bug 22134 - Clarify byte stream format enforcement. Bug 22431 - Convert videoPlaybackQuality attribute to getVideoPlaybackQuality() method. Bug 22109 - Renamed 'coded frame sequence' to 'coded frame group' to avoid confusion around multiple 'sequence' concepts. Bug 22139 - Added a note clarifying that byte stream specs aren't defining new storage formats. Bug 22148 - Added playbackJitter metric. Bug 22134 - Added minimal number of SourceBuffers requirements. Bug 22115 - Make algorithm abort text consistent. Bug 22113 - Address typos. Bug 22065 - Fix infinite loop in coded frame processing algorithm. Bug 21431 - Updated coded frame processing algorithm for text splicing. Bug 22035 - Update addtrack and removetrack event firing text to match HTML5 language. Bug 22111 - Remove useless playback sentence from end of stream algorithm. Bug 22052 - Add corrupted frame metric. Bug 22062 - Added links for filing bugs. Bug 22125 - Add "ended" to "open" transition to remove(). Bug 22143 - Move HTMLMediaElement.playbackQuality to HTMLVideoElement.videoPlaybackQuality. Bug 21954 - Add [EnforceRange] to appendStream's maxSize parameter. Bug 21953 - Add NaN handling to appendWindowEnd setter algorithm. Fix links for all types in the IDL that are defined in external specifications. Bug 20901 - Remove AbortMode and add AppendMode. Bug 21911 - Change MediaPlaybackQuality.creationTime to DOMHighResTimeStamp. Reworked ambiguous text in a variety of places. Bug 21822 - Fix 'fire ... event ... at the X attribute' text. Bug 21819 & 21328 - Remove 'compressed' from coded frame definition. Bug 21796 - Removed issue box from 'Append Error' algorithm. Bug 21703 - Changed appendWindowEnd to 'unrestricted double'. Bug 20760 - Adding MediaPlaybackQuality object. Bug 21536 - Specify the origin of media data appended. Bug 21327 - Crossfade clarifications. Bug 21334 - Clarified seeking behavoir. Bug 21326 - Add a note stating some implementations may choose to add fades to/from silence. Bug 21375 - Clarified decode dependency removal. Bug 21376 - Replace 100ms limit with 2x last frame duration limit. Bug 21301 - Change timeline references to "media timeline" links. Bug 19676 - Clarified "fade out coded frames" definition. Bug 21276 - Convert a few append error scenarios to endOfStream('decode') errors. Bug 21376 - Changed 'time' to 'decode time' to append sequence definition. Bug 21374 - Clarify the abort() behavior. Bug 21373 - Clarified incremental parsing text in segment parser loop. Bug 21364 - Remove redundant condition from remove overlapped frame step. Bug 21327 - Clarify what to do with a splice that starts with an audio frame with a duration less than 5ms. Bug 21112 - Add appendWindowStart & appendWindowEnd attributes. Bug 19676 - Clarify overlapped frame definitions and splice logic. Bug 21172 - Added coded frame removal and eviction algorithms. Bug 21170 - Remove 'stream aborted' step from stream append loop algorithm. Bug 21171 - Added informative note about when addSourceBuffer() might throw an QUOTA_EXCEEDED_ERR exception. Bug 20901 - Add support for 'continuation' and 'timestampOffset' abort modes. Bug 21159 - Rename appendArrayBuffer to appendBuffer() and add ArrayBufferView overload. Bug 21198 - Remove redundant 'closed' readyState checks. Remove Source Buffer Model section since all the behavior is covered by the algorithms now. Bug 20899 - Remove media segments must start with a random access point requirement. Bug 21065 - Update example code to use updating attribute instead of old appending attribute. Bug 19676, 20327 - Provide more detail for audio & video splicing. Bug 20900 - Remove complete access unit constraint. Bug 20952 - Added update event. Bug 20953 - Move end of append event firing out of segment parser loop. Bug 21034 - Add steps to fire addtrack and removetrack events. Bug 19676 - Added a note clarifying that the internal timestamp representation doesn't have to be a double. Added steps to the coded frame processing algorithm to remove old frames when new ones overlap them. Bug 18933 - Clarify what top-level boxes to ignore for ISO-BMFF. Bug 18400 - Add a check to avoid creating huge hidden gaps when out-of-order appends occur w/o calling abort(). Added steps to various algorithms to throw an INVALID_STATE_ERR exception when async appends or remove() are pending. Remove early abort step on 0-byte appends so the same events fire as a normal append with bytes. Added definition for 'enough data to ensure uninterrupted playback'. Updated buffered ranges algorithm to properly compute the ranges for Philip's example. 15 January 2013 Replace setTrackInfo() and getSourceBuffer() with AudioTrack, VideoTrack, and TextTrack extensions. Renamed append() to appendArrayBuffer() and made appending asynchronous. Added issue boxes to relevant sections for outstanding bugs. 14 December 2012 Pubrules, Link Checker, and Markup Validation fixes. Added MPEG-2 Transport Stream section. Added text to require abort() for out-of-order appends. Renamed "track buffer" to "decoder buffer". 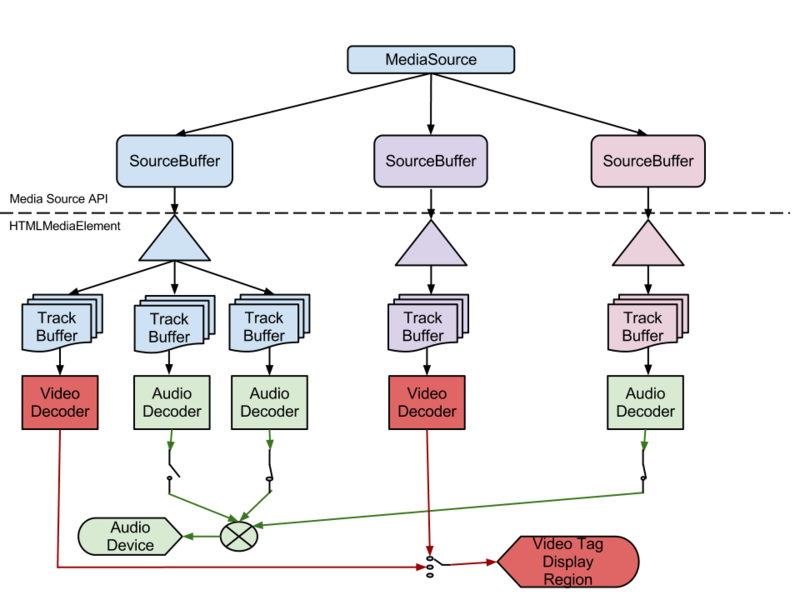 Redefined "track buffer" to mean the per-track buffers that hold the SourceBuffer media data. append() now throws a QUOTA_EXCEEDED_ERR when the SourceBuffer is full. Added unique ID generation text to Initialization Segment Received algorithm. Remove 2.x subsections that are already covered by algorithm text. Rework byte stream format text so it doesn't imply that the MediaSource implementation must support all formats supported by the HTMLMediaElement. Added transition to HAVE_METADATA when current playback position is removed. Added remove() calls to duration change algorithm. Remove initialization segments are optional text. 09 November 2012 Converted document to ReSpec. 18 October 2012 Refactored SourceBuffer.append() & added SourceBuffer.remove(). Defined what HTMLMediaElement.seekable and HTMLMediaElement.buffered should return. Updated seeking algorithm to run inside Step 10 of the HTMLMediaElement seeking algorithm. Removed transition from "ended" to "open" in the seeking algorithm. Clarified all the event targets. 1 October 2012 Fixed various addsourcebuffer & removesourcebuffer bugs and allow append() in ended state. 13 September 2012 Updated endOfStream() behavior to change based on the value of HTMLMediaElement.readyState. Added early abort on to duration change algorithm. Added createObjectURL() IDL & algorithm. Added Track ID & Track description definitions. Rewrote start overlap for audio frames text. Removed rendering silence requirement from section 2.5. Clarified WebM byte stream requirements. Clarified addsourcebuffer & removesourcebuffer event targets. Clarified when media source attaches to the HTMLMediaElement. Introduced duration change algorithm and update relevant algorithms to use it. 17 August 2012 Minor editorial fixes. 09 August 2012 Change presentation start time to always be 0 instead of using format specific rules about the first media segment appended. 30 July 2012 Added SourceBuffer.timestampOffset and MediaSource.duration. 17 July 2012 Replaced SourceBufferList.remove() with MediaSource.removeSourceBuffer(). 26 June 2012 Converted to Editor's draft. 0.5 Minor updates before proposing to W3C HTML-WG. 0.4 Major revision. Adding source IDs, defining buffer model, and clarifying byte stream formats. 0.2 Updates to reflect initial WebKit implementation.